The issues of B2B management and B2B marketing are becoming of increasing interest to business scholars and practitioners. 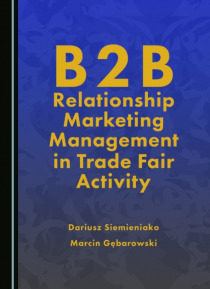 This book is the first publication dedicated solely to the connection between relationship marketing management and trade fair activity management, two essential marketing concepts. It investigates the role of trade fairs with regard to B2B relationship marketing management in… the era of the world economic crisis using the example of the retail real estate industry. A vital issue tackled in this book refers to the exploration of the characteristics of retail real estate trade fairs from the perspective of creating conditions favourable for developing business relationships. The book begins by presenting the issue of contemporary retail real estate trade fairs and the methods of researching into the marketing activity of exhibitors. It then uses a four-stage primary research method to propose a model of managing retail real estate trade fair participants' relationships with customers and other trade fair participants. The results of this study are then used to present the issue of trade fair activity management in a project life cycle, before the book goes on to explore the general problem of relationship marketing management in B2B services. In addition, it also discusses marketing activities participated in during trade fairs, such as experiential marketing and a trade fair conversation. As such, the book provides an extensive perspective on the researched phenomenon, and its findings will also be useful in other industries.